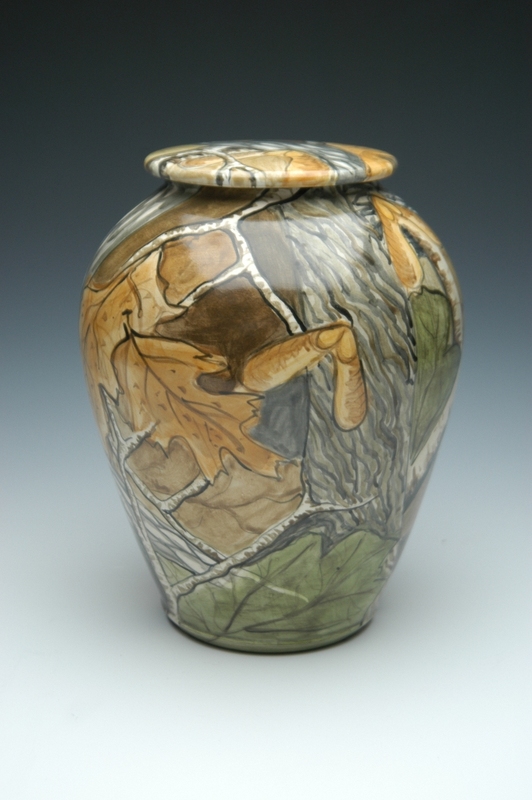 The beautiful Hand-Painted Camo Urn is a hand-thrown ceramic porcelain work of art made by a ceramic artist in the Pacific Northwest with over 30 years of experience. The urn is carefully painted by hand with incredible attention to detail and designed with a forest-theme. This cremation urn is unique and perfect for any one who loves nature or hunting, was in the military, or who wants a trully unique urn. As these are custom works of hand-crafted art, please allow three months before your urn is shipped. Wondering how to choose the right size urn? Please click on Choosing the Right Size Urn Here. You may be wondering about the lids. Some people choose to leave the lid unsealed as the ashes are kept in a sealed plastic bag. However, many choose to seal the lid. Please Click on Ceramic and Marble Sealing Instructions Here.